Why are there more cyclists using the roads? The numbers of people choosing to cycle for fun, fitness or to get to work has increased by more than a quarter in twenty years and an incredible 3.2 billion miles are cycled on our roads every year. (Think!) Add this to the ever-increasing amount of cars on UK roads and all of a sudden, there isn’t much space to share. Although cycling-related deaths are at an all-time-low since 2010, there were still 3,337 cyclists killed on the road in 2015 (source), and figures released by the Department for Transport last year suggested cyclists are 17 times more likely to be killed on the road than those travelling in vehicles. While charities such as THINK! are helping to raise awareness and remind motorists about the safest ways to travel, there is still a lot that can be done to ensure that drivers and cyclists can use our roads in harmony. We are Cycling states that cycling is essentially a safe activity, causing little risk either to cyclists themselves or to other road users. Moreover, there is good evidence that cyclists gain from ‘safety in numbers’, with cycling becoming safer as cycle use increases. However, fear of road traffic is a major deterrent, despite the health, environmental and other benefits of cycling. They also say that cycle safety in the UK lags behind many of our continental neighbours, because of poorly designed roads and junctions, traffic volumes and speeds, irresponsible driving, and a legal system that fails to respond adequately to road danger. National and local government should therefore aim for more as well as safer cycling. These two aims can and should go hand-in-hand. What can I do to stay safe as a driver? To make roads as safe as they can be, motorists need to be aware of cyclists too. In wet weather, allow cyclists extra room as surfaces may be slippery. The Highway Code also has specific information for both cyclists and drivers about how to safely and properly use the roads. What can I do to stay safe as a cyclist? Sometimes motorists can find it difficult to predict what a cyclist is going to do, so try and clearly signal any movements that could be seen as unusual to a driver. When driving large vehicles, motorists can find it very difficult to see cyclists on their nearside, even with all their extra mirrors, so maintain a safe distance. Failing to look properly is also a common mistake made by cyclists, and contributes to 42% of cyclist collisions at junctions. NEVER be tempted to ride down the inside of any vehicle (especially a bus or lorry) that is waiting at a junction. Hold back and stay behind where the driver can see you in their mirrors. Be patient and don’t squeeze down the inside by the gutter. 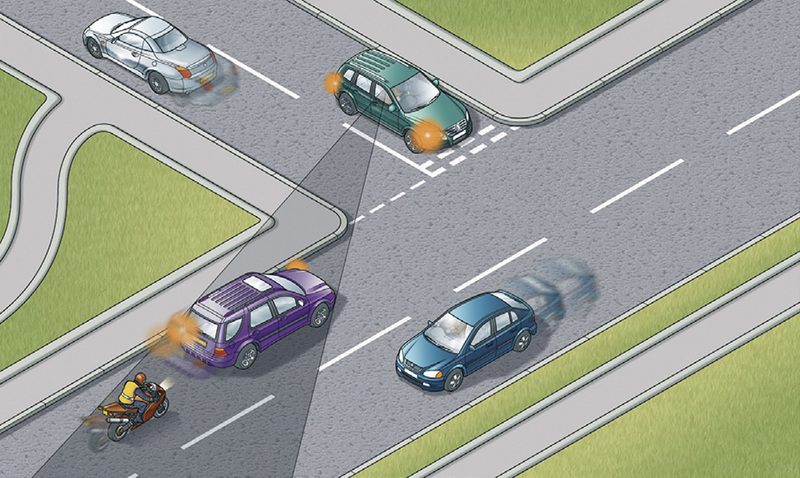 If a vehicle overtakes you close to a left turn junction, keep a safe gap behind the vehicle in case the driver cuts in front of you to turn left. When overtaking a parked car, remember to leave enough room in case a door opens (‘leave a door and a bit more’) and be ready for someone to open a door as you pass. In normal conditions, ride in the ‘secondary position’, approximately 1/3 into the carriageway – avoiding debris and grid covers in the gutter. If you need to improve your visibility in poor conditions you can ride in the ‘primary position’, in the middle of the road. However, try not to hold drivers up unnecessarily. When riding together never ride more than two abreast, and ride in single file on narrow or busy roads and when riding round bends. The Highway Code says: At night your cycle MUST have white front and red rear lights lit. It MUST also be fitted with a red rear reflector (and amber pedal reflectors, if manufactured after 1/10/85). White front reflectors and spoke reflectors will also help you to be seen. Remember: BE SAFE BE SEEN. RoSPA diagram for maintaining a safe distance from HGVs. What’s being done to improve road safety? It isn’t only the public that are noticing the importance of safety for both drivers and cyclists. In June 2016 the government proposed implementing a fine of £5,000 for motorists that drove carelessly or too close around cyclists. While it’s true that nobody wants to get into an accident, they still happen. If your car hasn’t been running as smoothly as you like why not book it into your local Trust My Garage approved independent garage and get it back to tip-top condition? If you’d like to learn more about staying safe on the road with cyclists – whether you’re a driver or a cyclist – you can find plenty advice on websites such as Highway Code, Brake & Think!.